Roger Federer’s racquet of choice for most of his career has been a variant of a flat, “box beam” 90 square inch racquet from Wilson. Currently, it is the Pro Staff BLX 90. For a few weeks this past summer, the Swiss maestro experimented with a blacked out Wilson 98 prototype before going back to his old racquet for the Cincinnati masters and US Open. Now with a few weeks off before next month’s Shanghai Rolex Masters, the 17 time grand slam champion has time again for more racquet testing. What will he decide to play with going forward? Nobody but Roger Federer knows. 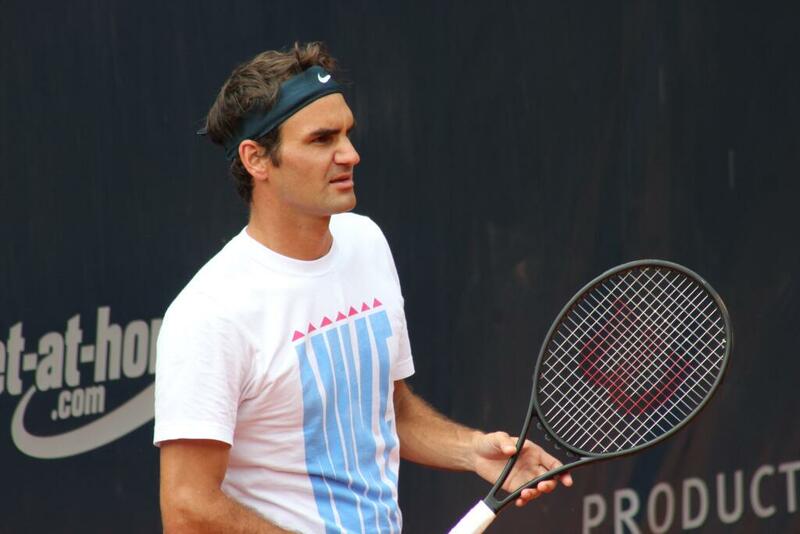 Many fans have become critical, overdoing the relevancy of simply switching to a larger and lighter racquet. The year has been tricky, a let down, and a disappointment. Is it all because of the racquet? Is it because of age (32) or doubts in his mind? What about the mileage? At 32, Federer has played nearly 150 matches more than Pete Sampras played in his entire career. He will soon pass Agassi’s total matches played, and the Las Vegas native was 36 when he retired. Perhaps it does come back in part, to the racquet. The following piece below was sent in from a fan and partially edited by FedFan07. The purpose is to engage all Federer fans and tennis fans alike, in a healthy discussion. Over the last year there has been plenty of talk regarding Roger Federer’s choice of racquet in a sport that has become increasingly about attrition, ability to grind out rallies often of extreme topspin nature, and willingness to out-will the opponent on exchanges where victory can be determined off of errors. This is quite a contrast from the higher risk, first strike tennis that the Swiss maestro grew up playing and continues to employ on tour today. Much of the talk among loyal Federer fans has revolved around the notion of increasing the surface area of his “Wilson wand”, the classical Pro Staff 90, to successfully combat the barrage of pace and vertical topspin he faces from the world’s best on a daily basis. Speculation was further fueled by this past summer, where he tested out a blacked out Wilson frame that was 98 square inches and in a far different mold in both thickness and beam shape to that of his classic weaponry. The results were mixed, ultimately marking a return to his 90 for the US Open series with the notion that he would resume racquet testing in the fall. With the fall indoor season approaching, the time has come once again to revisit the racquet, as it is bound to be a lightning rod following his most recent disappointment at the US Open. So, this begs the question, what is the best racquet for the magician of tennis as he enters his twilight years in a sport that has morphed into a physical struggle? It was clear when observing Federer in Gstaad and Hamburg that, back issues aside, the test frame was not providing the same heft of ball through the court that we were used to seeing given his slingshot-like forehand whip. Likewise, his slice backhand was not of the biting variety. The tradeoff however was that there were noticeably fewer shanks (once he got into a groove) and he was able to utilize added spin to construct points a bit more carefully, with more depth through the court. It was not telling enough whether his serve was greatly aided by the blacked out Wilson 98 prototype (readers chime in!). However, Federer was able to hit over more returns than he normally would be able to, instead of his usual style, blocking/chipping/slicing with the Pro Staff 90. Is this the ideal Federer approach to take given the transpiring in the US summer swing? After all, the sharpness of his shot making and the artistry with which he can pound away winners was on fine display for at least two and a half sets against Rafael Nadal in Cincinnati. When Federer is on the heft of his ball, it is unmanageable for the competition, proving difficult even for the tour’s best. On the flip side, his mis-hits, which have earned his nicknames like “Shankerer” and “Sir Federror” are often times attributed to that very same weaponry – a true double edged sword that cost him dearly against Tommy Robredo in a straight set disappointment under the lights of Louis Armstrong stadium. So what is the main issue in his current pattern of play, a pattern that produces wizardly strokes yet also brings mis-hits, particularly during crucial moments in matches? The answer may come down to maneuverability. Federer’s movement, primarily his hips that allow him to dance around the ball path to place him at optimal point to hit the ball, are just not as smooth as they were 200 matches ago. The body has a lot of wear an tear on it, and that leads to making life a lot more arduous for the Swiss maestro as he attempts to float around the court to display his magic. Federer is a slingshot hitter, and in order to take the ball early and on the rise he needs have his swing speed through the hit zone match up with whatever type of spin, slice or massive topspin, that he is faced with. Further, he is also an “explosive off your ankles” hitter; Watch him in full flight and you will appreciate how smoothly he can curl around the outside of the ball and direct it back with interest. His feel is also closely tied to the frame he has played with his entire career. As any playtester will attest to, there is a huge difference between a 98 square inch frame and the box beam 90 counterpart. It is the feel that allows Federer to work his precision accuracy. His dexterous hands can feel almost every inch of the ball on his frame, and any slight change in that could have catastrophe effects on his ability to dictate the point. How best to solve this issue in the new frame? Here is a novel suggestion. Go ahead and borrow, specifically for the throat region of the racquet, from the AeroPro lineage of technology! One of the things that make the Babolat AeroPro such a great racquet for both novice recreational and advanced players to hit with is its rather seamless maneuverability in the confines of a players’ hands. Swinging “through” the hitting zone, whether the zone is more horizontal or vertical (or somewhere in between) is made immeasurably easier due to the airfoil pattern in the throat of the racquet. The modeling allows the racquet to fly rather seamlessly through the hitting zone, never providing the sort of inertia we are accustomed to seeing with the classic Pro Staff racquet. It is about the reduction of frictional drag during swing of the racquet frame. Why could this prove to be pivotal for King Federer’s game? Timing. In tennis timing is everything. If you give a great professional an extra nanosecond to do his or her business, often times they are going to convert that into an advantageous situation. Give Roger Federer that nanosecond and imagine even at 32 what he could produce on court. Dropping this drag will not only help the Swiss maestro construct baseline points but make his frame that much more maneuverable up at net, where he is trying to be more often to end points in an emphatic manner. By maintaining the same specifications in the upper racquet head area as the current Pro Staff (box beam, 17.5mm, perimeter weighting system (PWS) on the 3 and 9 o’clock points) it allows Federer to maintain the same “feel” of the ball on the string bed. It would not be as drastic a transformation as say, switching both the throat and the racquet head geometry, as was the case in his previous play test. Note that I am not advocating an outright change to a Babolat AeroPro racquet, rather to use the utilization of its shape and geometry specifically in the throat region to allow for greater maneuverability through the air. So, Wilson reps, how about it? The “AeroStaff” model? I am sure the team in Chicago can come up with something similar for Federer to test in the fall months (perhaps they already have!). I would love to hear from the Federer fans out there about what equipment ideas they may have to help Federer retool his game for 2014, and hopefully beyond. For those who are more scientifically inclined, what do you think about this proposed Wilson AeroStaff idea? Is it feasible, is it plausible, or is it just a poor combination idea from a fan? How would increased maneuverability impact spin potential? How would added implementation of modern day stringing patterns, as being evidenced in the Wilson Steam 99S, potentially enhance this proposed racquet design? As always, I am looking forward to what the Fed-verse has to say about it, and thank you again for reading!